We love autumn. And no, it’s not just because of the pumpkin spice lattes or the scarves (although, those are also fantastic). It is because make-up trends get so fun in the fall! We love the au natural look of the summer time, but by September, we are itching to try out new and exciting trends and techniques, and we can guess that you are too! Today, it is all about the lips. Lipstick is one of the hottest accessories a make-up lover can own, and we are thrilled to see lipsticks back on high trend. Not only is just lipstick back on trend, but bold lipstick, and we are stoked! The hottest lip trend you will see this fall (and probably into winter) is the berry-tone trend. These are the deep purples, reds, and magentas coming out to play. Darker lipstick is back! So venture out and go with the rich berry colours you can find out there! Right now, we are really enjoying Sephora brand’s array of colours. They go on smooth and last for a few hours with minimum wear. We are not talking lip stain here, you will have to re-apply every once in a while. But who doesn’t love applying lipstick! It feels like one of the classiest things to do! Another trend is neutrals – so pinks and peaches and browns. Of course, matching to your skin tone is an absolute must. It is important to speak with a professional when matching lipstick to skin tone. This isn’t foundation, you can’t just apply it and see if it matches – it is all about the undertones. Make sure you talk to someone at the counter to get the best advice! Most places make employees go through vigorous training to work at a make-up counter. Take advantage of their knowledge! If you are shy, we have a little cheat sheet for you! 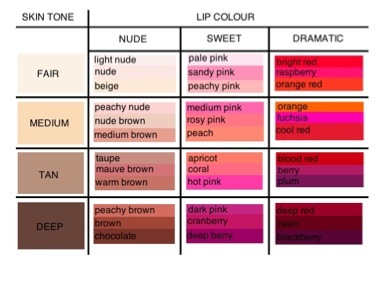 Of course, these are very broad categories for skin tone – we completely understand that you may fall in between or outside of these tones, which is why it is still best to ask!